Connected to the Durham Convention Center and next door to the restored Carolina Theatre in Durham’s downtown area, the Durham Marriott City Center offers not only convenience for NAEP attendees but also a newly renovated hotel. Comfortable and relaxed, the hotel's downtown location is just moments from Duke University, Research Triangle Park, the American Tobacco Campus and fine dining. A block of sleeping rooms has been reserved for NAEP attendees at the conference rate of $149 single/double per night plus applicable state and local taxes (currently 13.5%). NAEP attendees will enjoy the fresh, contemporary look of the newly renovated hotel. Complimentary Wi-Fi will be offered in the sleeping rooms. In addition, there is a 24-hour business center located on the first floor which can be accessed with your hotel key. For those driving, the hotel will offer a $9.00 per day parking charge for hotel guests. The 201 Restaurant and Lounge, conveniently located on the lobby level, offers on-site dining throughout the day and evening. Raleigh-Durham International Airport serves the Research Triangle Region of North Carolina, a multi-county area that includes the state capitol of Raleigh, as well as the vibrant cities of Durham, Chapel Hill and Cary along with dozens of larger towns and small communities throughout the central portion of the state. 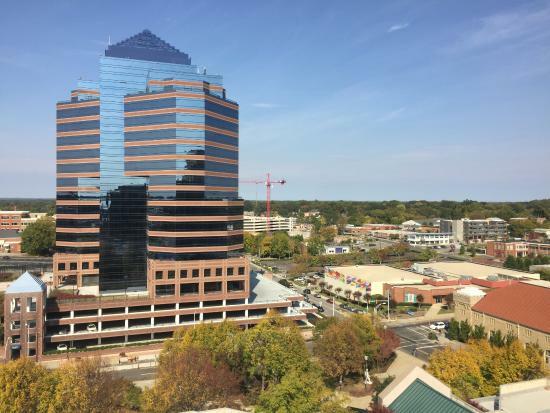 The region’s name comes from the Research Triangle Park, one of the largest dedicated research and industry zones in the nation. Raleigh-Durham International Airport is home to nine air carriers, flying customers to 47 nonstop destinations on 400+ daily flights. Terminal 1 services Southwest Airlines. Terminal Two services other major carriers such as American, Delta, and United, among others. RDU Taxi, Inc. is the sole, licensed taxi service provider for Raleigh-Durham International Airport. Metered fares and customer service standards are implemented and monitored by the Raleigh-Durham Airport Authority. Taxi dispatchers are located outside the terminals at RDU. The Terminal 1 Taxi Dispatch Booth is located outside Bag Claim 3. At Terminal 2, the booth is located on the lower level outside Bag Claim 1. You may also schedule a taxi reservation to RDU Airport by contacting RDU Taxi, Inc. at (919) 840-7277. Handicap-accessible vehicles are available upon request. Reservations are not needed when departing from RDU. Simply proceed to the Taxi Dispatch Booth located outside each terminal. RDU also allows Uber and Lyft to service both terminals. More information can be found at https://www.uber.com/airports/rdu/ and https://www.lyft.com/airports/rdu .